Dear Hilary & Simon & Tallulah, Loz & I went to the tank museum while Linda & Ann went to the more intellectual attraction of Kingston Lacy House. The first launching of the boat was not a success but will provide an entertaining story when we next see you. Hope your hol went well, our first attempt at UK camping has been surprisingly not too bad. Love Ann Gordon & Laurie. Postmarked ‘BOURNEMOUTH – POOLE 8.30pm 22 AUG 1991’ this card carries a 19p stamp and also carries the infamous ‘REMEMBER to use the POSTCODE’ postmark. Lots of descriptive information is included in this status update, including the tantalising suggestion of a more detailed and hilarious anecdote to follow! Here’s another postcard being used to update an address change. It’s amazing how often we all did that, back in the day! It is unclear whether Ged is staying in the hotel or working in it – the latter I suspect. Either way he’s obviously not a fan, despite the ‘warm welcome, courtesy and friendliness’ promised in print at the bottom! 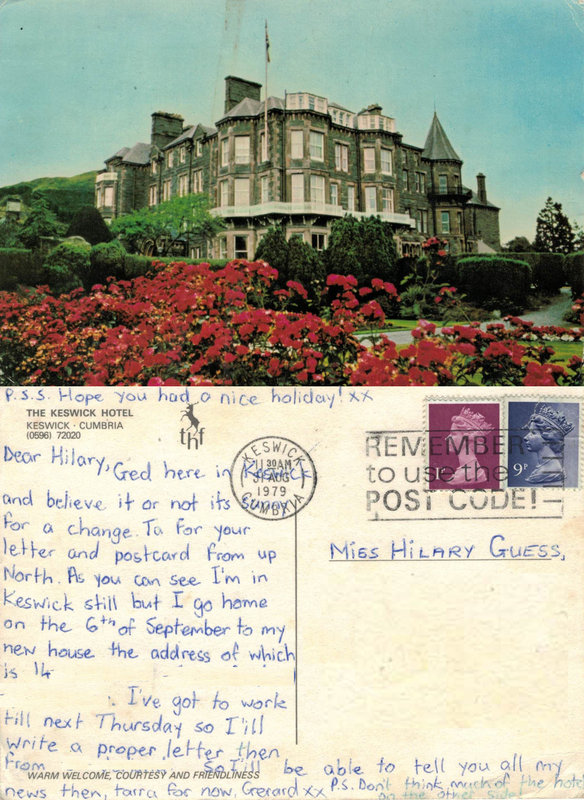 Sunshine in Keswick is, of course, worthy of a comment 🙂 My postcard to him was from even further ‘up North’ – our family holiday that year was spent driving and camping round the north coast of Scotland. Postmarked ‘KESWICK 11.30am 31 AUG 1979 CUMBRIA’, this card was posted exactly 37 years ago today! The other postmark is the old favourite ‘REMEMBER to use the POST CODE!’ which he hasn’t. The card carries 10p worth of stamps which is approximately 52p today (2016).